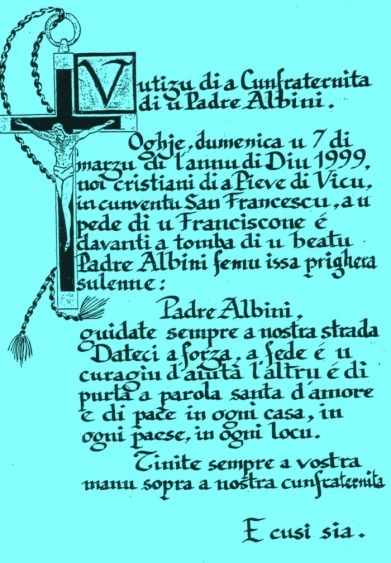 Born in Mentone, Italy (at present France) on November 26, 1790, and ordained priest in 1814, Charles Dominic Abini entered the Congregation of the Missionary Oblates of Mary Immaculate at the age of 34. He strove constantly to keep himself recollected in the presence of God al the same time as being prodigiously active in educating students for the priesthood and in preaching the Gospel ali through the land. He came to be known as the Apostle of Corsica in which island he died a holy death on April 14 1839. The cause of bis beatification was introduced at Rome on April 14, 1915. His was declared Venerable by Paul VI in 1968. O God who by Thy Holy Spirit inspired Thy servant Charles to dwell in intimate union of mind and heart with Thee and by Thee alone to be guided in his apostolic labours, grant us ever to abide in Thee so that all our thoughts and desires and our dealings with our fellowmen be truly inspired by Thy charity. Humbly confident that Thou willest the merits of Thy servant to shine before all men, we implore Thee to bestow upon us, through his intercession, the special grate which we seek of Thy bounty in the name of Jesus Christ Thy Son. Amen. Kindly notify an Oblate Father in your vicinity, or the Reverend Father Postulator (290, Via Aurelia, Rome: C.P. 9061, 00100 Roma-Aurelio, Italy) of any favour obtained.